Anxious wait turned to pure joy as my daughter Amber gave birth to a beautiful, healthy baby boy in San Francisco after a prolonged labor last weekend. The arrival of my first grandchild was a very exciting moment for all of us and our son-in-law Glenn's brothers and parents. Soon after normal delivery, Yasmeen, Michelle and I rushed to the hospital room to hold the baby and smiled and cooed at him with excitement. He was comfortably swaddled in a soft, warm flannel blanket patterned with pink and blue baby footprints. 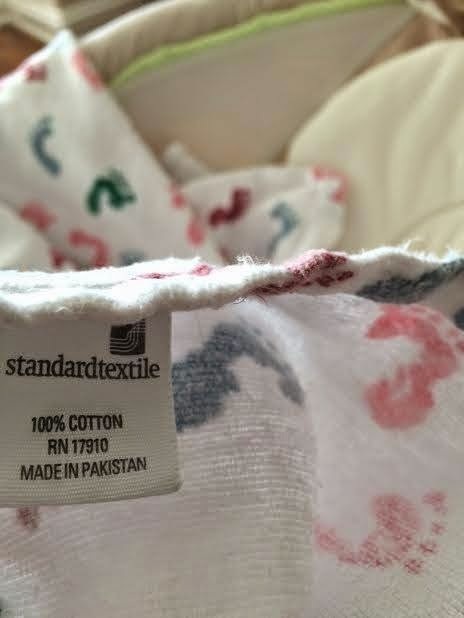 A quick look at the tag revealed that the blanket was made in Pakistan. As we decided to share the unique happy moment through pictures with our global family and friends, the obvious choice to reach most of them was via Facebook. The news spread fast and the congratulatory messages poured in. A friend of mine who is an experienced grandfather offered the following interesting advice: "It's for the parents to raise their children and the grandparents to have the privilege and joy of spoiling their grandchildren". My good friend Rizwan Kadir from University of Chicago offered his best wishes and shared a link to a 2011 NPR story on baby blankets titled "Born In The USA? This Blanket Might Look Familiar". The NPR report said that most of the baby blankets used in US hospitals are made in Pakistan and supplied by the medical supply company Medline, based in Mundelein, Ill. Jim Robertson, president of Medline's Medcrest textile division, told NPR in 2011 that the company has produced close to 25 million of the blankets since 1980 alone. Another story in Quartz said the (Medline baby) blankets are sold all over the world, and made in Karachi, Pakistan. Since its creation more than 60 years ago, Medline's Kuddle-Up blankets, which are manufactured in Pakistan, are sold globally. Yasmeen and I are fortunate to have a great extended family and many sincere friends who have shared in our joy. We take this opportunity to thank them all for their congratulatory messages and sincere best wishes for us, our children and the newborn grandchild. Riaz Bhai, Congratulations!! May Allah bless you and your family. Dear Riaz the news of a grandchild is always good news and as your friend Kadir says "they are meant to be excessively pampered by the grandparents" Something that they dared not do with their own. All the best, since you now have something to do in your spare time. I see in the picture that you have already started. Regards to your family and especially the NEW mother. 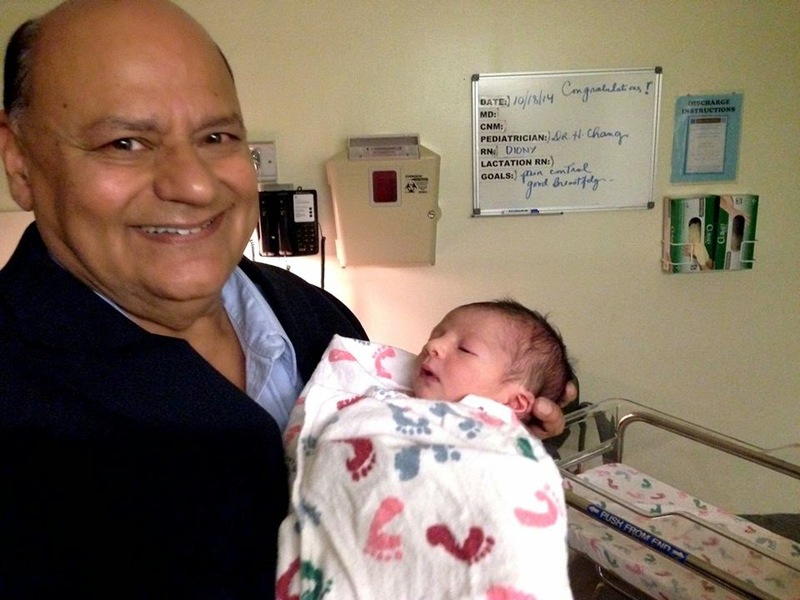 MAT: "Greetings and best wishes for you and family for the first grand daughter"
Thank you Muhammad Amil Tahir sahib. A minor correction: It's a boy , not girl. Enjoy your stay in San Francisco. Congratulations. Hereafter all your blogs will be "Grandfather" blogs!. On this happy moment, i wish to share an important thought which i feel can make a difference. I found children are the biggest unifying force in this world. Husbands and wife who quarrel are held together by kids. Sons/daughters who marry against wishes of parents join back under influence of kids. I sincerely believe, Humanity is alive and kicking only because of kids who enrich our lives. May i request all your viewers to pledge not to feed hate or disharmony in these tender minds which are the foundation of human joy. On the arrival of your grandchild, I mean, and not on the issue of where a particular piece of cloth was made. Interloop Limited has successfully raised Rs5.025 billion through the largest private sector Initial Public Offering (IPO), placing itself among the top 50 companies listed on the Pakistan Stock Exchange (PSX) by market capitalisation, the company said on Thursday. The company that supplies foot-hosiery to global sportswear giants like Nike and Adidas said, the two-day book building process was oversubscribed by 1.37 times with the price closing at Rs46.10/share. The total demand received was Rs6,727 million against total issue size of Rs 4,905 million, oversubscribed by Rs1,822 million or 1.37 times. Arif Habib Limited is the consultant to issue for the IPO, while Ismail Iqbal Securities has been the book runners. The Interloop offer has surpassed the previous record for a private company, when Pakistan Stock Exchange Ltd raised Rs4.5 billion two years ago. There have been larger sales by state-controlled companies in Pakistan. Interloop is one of the world’s largest hosiery manufacturers and has an annual turnover in excess of Rs30 billion. The company in a statement said one of the main objectives for the IPO was to expand hosiery production by opening a new plant and simultaneously and entry into the apparel business by opening a denim plant in Lahore, for which land had already been acquired. Interloop Ltd., which makes socks for Nike and Adidas, is planning Pakistan’s biggest ever initial public offering by a private firm.